Against the backdrop of threats of military aggression by the United States, a series of provocations took place this weekend on the Colombian-Venezuelan border. Analysis of an ongoing coup d’état by Alex Anfruns. 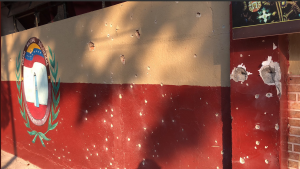 On Sunday, February 24, some sixty paramilitaries surrounded a Bolivarian National Guard barracks, according to journalist Madelein Garcia of TeleSUR from the scene. The assault lasted about an hour. There were about 30 soldiers at La Mulata’s command post. The paramilitaries demanded their surrender and the surrender of their weapons. They addressed the Venezuelan armed forces: “Give yourselves up, don’t lose your life for this government, it’s not worth it, come and negotiate. We will make a change of government. The young officials expressed their morale : “What were we thinking at that moment? At least resist, I didn’t want to give up, I didn’t want to give up, I wanted to continue fighting. To surrender was death”… One of them said he was prepared for another attack: “We must always maintain the same motivation to defend the homeland. 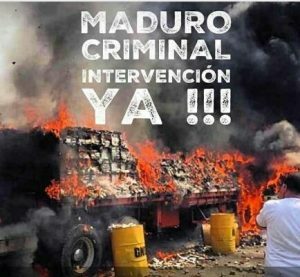 In the border town of Ureña, opponents set fire to a bus and the entrance to the Bolivarian school. Street vandalism tactics already used in Venezuela in 2014 and 2017. A bus taking the artists to the peace concert “Para la guerra, nada” on the Venezuelan side of the border was attacked by the opposition. Did humanitarian aid really go up in smoke? The arson of the truck on the Santander Bridge, whose images have travelled all over the world, seems to have been started by young Colombians. Unlike the version that accused the border police authorities, the images show a Molotov cocktail thrown into the truck. Local television was also able to film the preparation of these projectiles in situ. 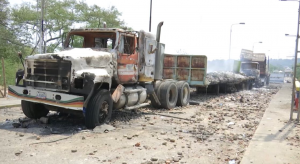 In addition, Venezuelan government spokespersons have provided images that contradict the version of a truck containing “humanitarian aid,” and showed the smoking remains of the kits intended for use in street-blocking tactics. Under the Santander Bridge, Colombian demonstrators were preparing an incursion into Venezuelan territory in front of Cúcuta TV cameras. Referring to an action probably coordinated with the paramilitaries, one of their leaders gave a clear instruction: “What I want to tell you is that as soon as they return there and the elements begin to surrender and take possession of the Venezuelan weapons, you have to discharge those bastards,” that is, kill the men who would surrender. For García, “if the caravan with “humanitarian aid” had advanced with the equipment for the street blockades, it would have been difficult for the reinforcements to help the post attacked by the paramilitaries. Once control of the Bolivarian National Guard post was taken, Ureña Street would have been the bridgehead. Very early in the morning, tension at the Simón Bolívar International Bridge was at its height, when three desertiñg soldiers crashed their vehicle into barriers causing several injuries, among them a border police officer and a Chilean journalist. Later that day, Chilean photojournalist Nicole Kramm explained: “They wanted to kill civilians at the border. At full speed. I narrowly escaped. I can’t believe they presented themselves as heroes. 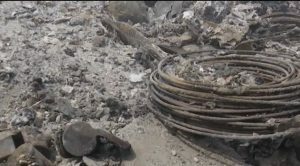 A freelance journalist, Kramm is part of a collective of photojournalists and collaborates with several media outlets, including Piensa Prensa, which broadcast this video in which one of the demonstrators confesses that the truck was burned by a Molotov cocktail. The Franciscan father in exile José Palmar also asked for an intervention: “Faced with this abominable violence in which there are dead and wounded, I ask President Juan Guaidó, in the exercise of his powers, to invoke Article 187 of the National Constitution which says: ‘Authorize the use of Venezuelan military missions abroad or foreign missions in the country'”. 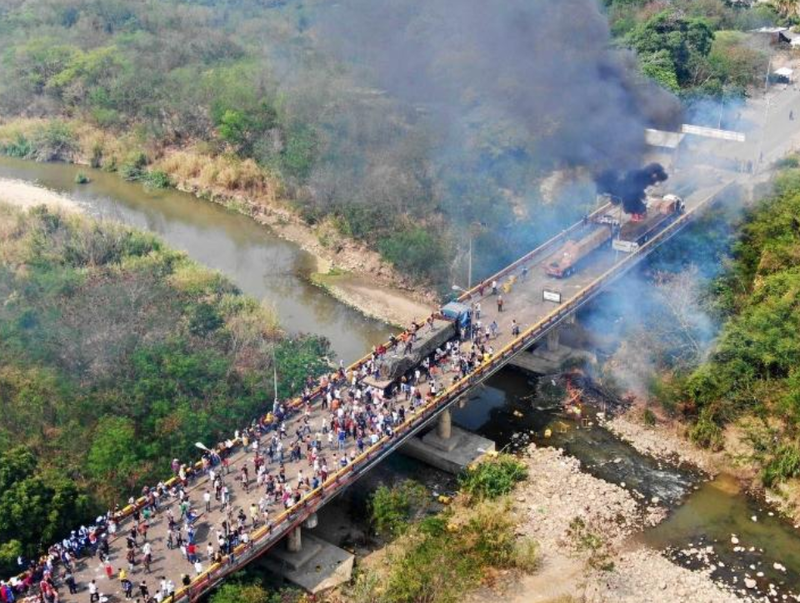 In the morning, an opposition march with Venezuelan Congressman Ismael García went from Cúcuta, Colombia, to the Las Tienditas bridge on the Venezuelan border to force entry for “humanitarian” reasons. His speech was that of fanatical evangelists comparing themselves to Moses. Placed nearby, U.S. and Colombian army soldiers were on the lookout. But the plans did not go as scheduled. Logo fraudulently reproducing that of the Red Cross in order to influence world public opinion. 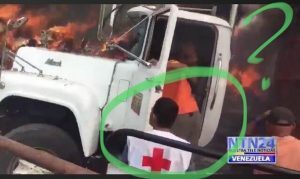 The Committee of the International Red Cross denounced the use of a false logo of its organization by the Venezuelan opposition, recalling that the Red Cross would not participate in this campaign, considering that “it is not humanitarian aid” what is being delivered. “We have learned that there are people who are not affiliated to the Colombian Red Cross or the Venezuelan Red Cross and who wear Red Cross emblems on the Colombian-Venezuelan and Brazil-Venezuelan borders. We urge them to stop. Your intentions may be good, but they may jeopardize our neutrality, impartiality and independence. After the failure of the operation to cross the border in defiance of international law, Senator Marco Rubio showed the true intent behind the alleged humanitarian aid by publishing the obscene photo of the bloody lynching of Gaddafi: an obvious threat to President Nicolas Maduro. After the battle of images that took place this weekend, Guaidó is scheduled to meet with U.S. Vice President Mike Pence on Monday. He said he would announce “concrete measures” after his meeting. At least things are clear: on the one hand, the fundraising concert was used as a pretext for dangerous provocations, seeking a reaction from the Venezuelan authorities. On the other hand, this shows that it is not the Guaidó congressman who is running things, but President Trump who is the boss. Unfortunately, the Venezuelan opposition has fallen into a fatal trap for the people it seeks to save. It is part of a macabre scenario written by U.S. hybrid war strategists. The defense of peace goes hand in hand with the right to information. This requires a critical mind and not being dragged into a wave of hatred and even panic fueled by prejudice and manipulation.